Kolhapuri is known for its delicious & spicy mutton curries.This recipe is almost 12 years old and tastes so good.This one is from my North-Indian speciality (recipe) collection.Try this at home and enjoy!. Mix all the marination ex.ginger-garlic paste and salt and evenly rub the marination on mutton pieces and keep this in fridge for an hour atleast. To prepare the Kolhapuri Masala:Heat oil in a kadai,add coriander seeds,cumin seeds,sesame seeds,poppy seeds,red chillies,clove and saute this till the seeds begin to crackle.Add the onions and saute this till golden brown.Finally add the grated coconut and saute for 2-3 mins.Turn off the flame.Leave this aside for 15 mins and grind this into a fine paste with 50ml water.Keep this aside. Heat oil in a pan and saute the finely chopped onions on medium heat till it turns golden brown. Add the marinated mutton pieces,salt and coriander leaves and saute till oil separates from the mixture.Add 2 tbsp water and stir tilloil floats on top. (repeat this 3-4 times till the mutton is 3/4th cooked). Add the kolhapuri masala paste and saute till oil separates on top again.Add 2 cups water and bring it to boil. Then,cover and simmer(stirring constantly) till the mutton is done.Turn off the flame. Garnish with coriander leaves and Serve this delicious mutton curry hot with rice or Indian bread of ur choice. i liked it very much it is spicy and goes well with fried rice and roti and naan. For this recipe, should I use dry coconut or fresh coconut? 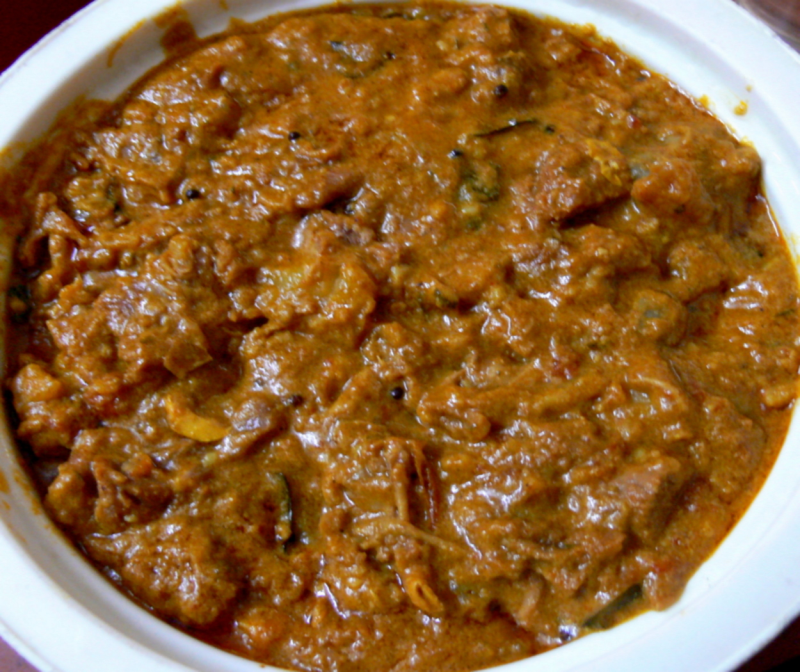 hi this is also a very commen and very popular local mutton dish in western maharashtra and tests really delicious!